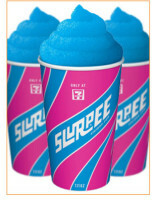 7-Eleven patrons will be given a free 7.11-ounce Slurpee simply for the asking anytime between 11 a.m. and 7 p.m. July 11. That's today!! !